How much does worker churn cost your business? A large and growing body of research shows that turnover is a significant expense to firms. But how do you calculate this cost, and what do you do with what you learn? Putting a dollar figure on the annual financial impact of losing and rehiring workers at your company may help you make the case – and find the resources – for investing in strategies to improve retention. One important retention strategy, investing in the education, training and development of your workers, is also good for your bottom line. 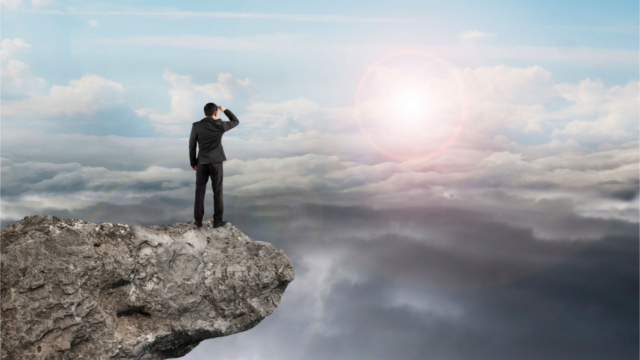 Companies that provide upskilling opportunities report reductions in their rate of turnover. Investing in upskilling could save your business money in the long term. We’ve created a tool to walk you through the steps to calculate cost of turnover. There are two versions: a worksheet that allows you to collect the information you need, and a Microsoft Excel version that will do the math for you. This Cost of Turnover Tool is a simple, “back of the envelope” calculator to help you estimate how much your business spends each year replacing staff. It is designed to help business representatives – from CEOs to human resources staff to accountants – know what questions to ask to understand the impact of turnover on the bottom line. The goal is to reasonably and fairly indicate the financial impact of turnover on your company. Some turnover costs – what we’ve called the direct cost of turnover – can typically be calculated using data collected as part of regular firm operations. Other turnover impacts like lower employee morale or poorer customer service – what we’ve called the indirect cost of turnover – are more difficult to quantify, but equally important to consider when assessing the financial impact that turnover may have on your business. Our basic worksheet helps you compile both the direct and indirect costs of turnover. However, we understand that some of these expenses are harder to track down than others. With this in mind, we encourage you to get started by calculating any costs that your business can reasonably estimate – and to use this tool to begin a larger conversation with your team about the costs that you might not be counting. Metrics matter, and calculating the tangible cost of worker churn can help you show key decision makers the return on investment that could be realized by addressing retention issues. Understanding where and why you are allocating your human capital dollars enables you to analyze whether resources are being used efficiently to meet business goals. This can help you make the case for investing in practices with potential to improve retention and productivity – such as upskilling and other improvements to workforce practices – and in turn save money. If you are already investing in upskilling programs, understanding your turnover volume and associated costs can give you a better picture of the outcomes you can expect from those programs. A high-turnover workforce is less able to benefit from training initiatives, since stability is a foundation for advancement. This tool is intended as a guide: Ultimately, you are best positioned to understand costs associated with turnover and its impact on your firm’s bottom line. The number you calculate with this tool is a baseline, intended to help you begin an important conversation about the value of investing in workers both to improve retention and achieve meaningful cost savings. A case study of a Minnesota long-term health care facility illustrates how one business leveraged a cost of turnover calculation to provide evidence of need for investment in its workforce. Company leaders were interested in learning more about retention, especially in relation to improving diversity. By calculating an approximate cost of turnover for certified nursing assistants (CNAs), they learned that they spent $13,432 each time they lost a CNA, primarily from overtime and lost productivity costs. They also learned that turnover was affecting morale of other staff who were filling in for vacancies and working harder to compensate for lost productivity. These lessons helped them make the business case for investing in a new partnership with a regional training program, Healthcare Academy. In addition to referring qualified, trained CNA candidates, academy staff helped the healthcare facility to develop a new, more personalized employee orientation program to support retention in new hires’ early days. The employer and training provider collaborated to conduct an assessment of business value of these services and new approaches to onboarding, and they learned that academy graduates stayed 50 percent longer – and academy minority hires stayed twice as long – as CNAs hired from other sources. Understanding the financial impact of losing workers, the healthcare facility could make a strong business case for strengthening their partnership with the academy and investing strategically in the CNA workforce. With support from the Walmart Foundation, in 2016 the Aspen Institute Economic Opportunities Program launched Reimagine Retail, a project to explore ways to enhance stability and improve mobility for the retail workforce. We are working closely with partners in six regions – Chicago, San Diego, the San Francisco Bay Area, Phoenix, Philadelphia, and Pittsburgh – to test strategies and capture learning about approaches they are using to support retail worker stability and advancement. Across and beyond the Reimagine Retail network, retail businesses and their workforce partners have asked for tools to help them better understand the talent retention challenges that hamper performance, and help them make the business case to invest in worker training and job quality improvements. Tweet The Cost of Turnover Tool by @upskillamerica & @AspenWorkforce is a simple, “back of the envelope” calculator to help you estimate how much your business spends each year replacing staff. Tweet Why invest in #upskilling and other strategies to improve retention? A new tool by @upskillamerica & @AspenWorkforce allows you to estimate your annual cost of turnover with a few simple calculations. 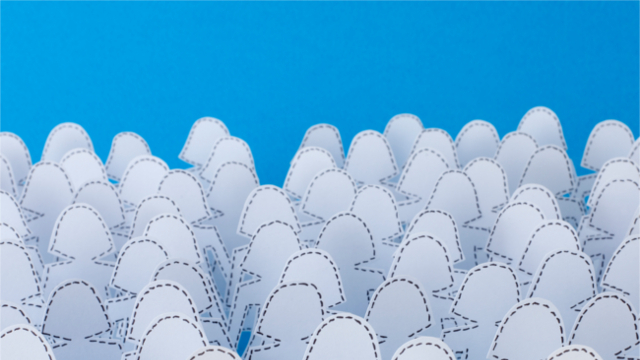 Tweet How much does worker churn cost your business? Turnover can be a significant expense to firms. But how do you calculate this cost, and what do you do with what you learn? 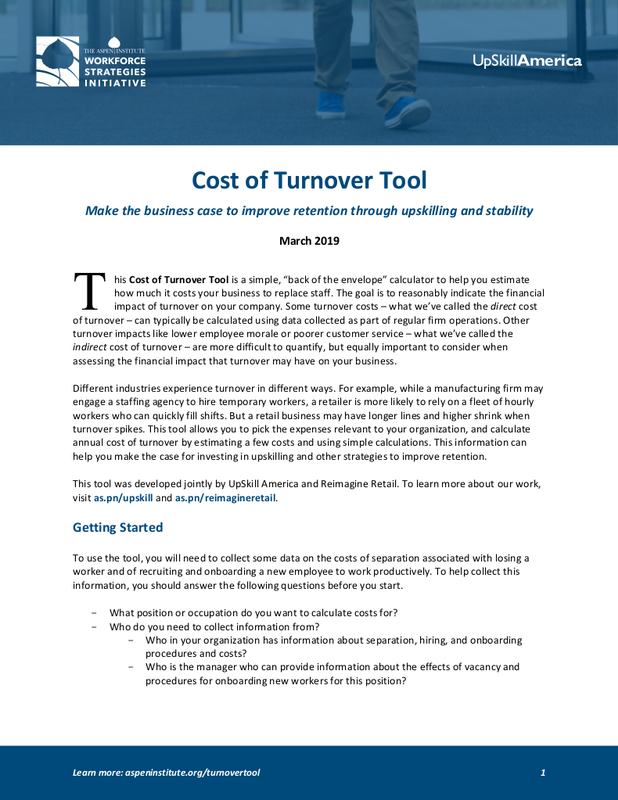 The cost of turnover tool is derived from EOP’s Business Value Assessment Toolkit, which includes more extensive guidelines for calculating costs of and value accruing from workforce development services. The toolkit includes a handbook that provides very detailed instructions for this type of assessment.